who had no decorations for her Christmas tree. During the night, a spider wove a web in her tree. the web had turned to silver. This fable is the story of tinsel. or a unique gift any time of year. The Christmas Spiders are $6 each and come in an assortment of colors to choose from. made with Swarovski Austrian Crystals on the legs and head. Dimensions: Average body bead is 20 mm (3/4 to 1 inch) diameter. ​Legs Stance 3 inches by 2 1/2 inches. All have a cord and story tag. All spiders are hand made in the U.S.A. by Sheryl Brakey. Not imported. The main body bead varies, so we will pick the bead to go with the chosen color. All Spider Photos are examples only. 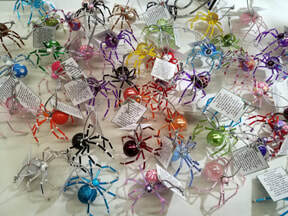 ​​Christmas Spiders are sold on this website and at Craft Shows. Click here to see our show schedule.